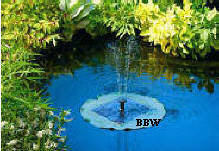 The Lily Floating Solar Fountain is is a great way to add an innovative and cost effective fountain to your pond. Simply place the floating unit in to water and watch the fountain come to life with the sun's rays. This fountain has a maximum height of 18 inches, making it a suitable accessory for the smaller pond or water feature. NO ELECTRICITY, NO WIRES! Just the suns rays! These water features do not require specialist installation and come complete with solar pump and panel enabling you to create an instant water feature in any garden, deck, patio, yard or conservatory. capable of pumping up to 22 gallons per hour in optimum conditions (direct, bright sunlight). It will help to oxygenate your pond, to prevent the growth of algae and minimize mosquito problems. The Lily is made of resin, so it is durable and long-lasting. Safe solar powered low voltage pump- activated by direct sunlight. Solar panel does not store energy for use at night or during overcast conditions. No assembly tools required, and no operating costs! NOTE: At this time the manufacturer is NOT offering replacement pumps or solar panels sold separately.